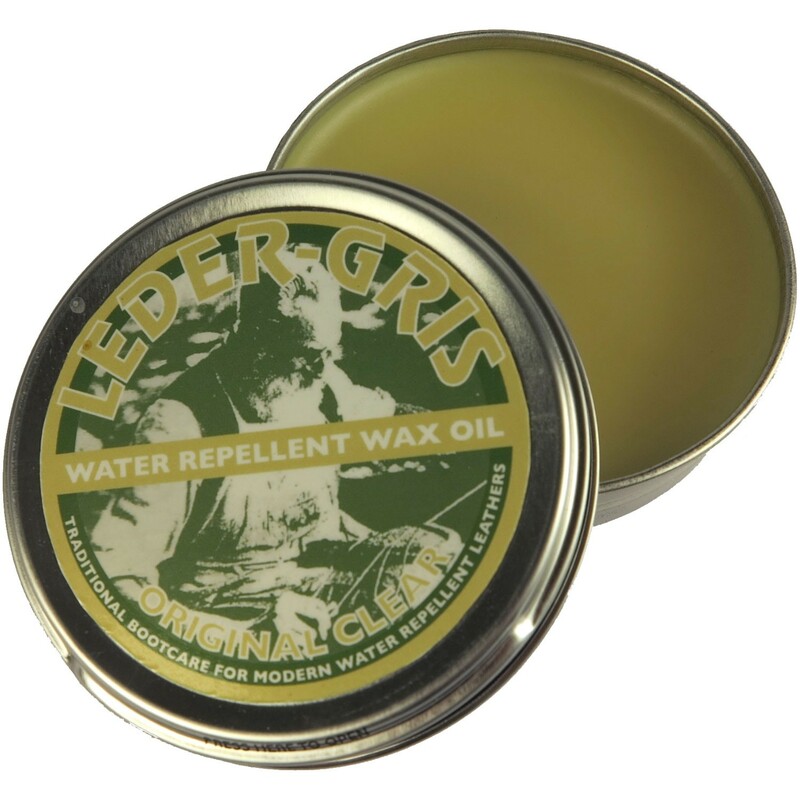 Leder-Gris Original is a mixture of 70% wax and 30% oil. It has been developed for everyday use in average UK conditions. The wax provides waterproofing as it dries – it remains on or just below the surface. The oil goes deeper into the leather, and helps to maintain the leather’s suppleness by replacing oils lost during the drying out process. If leather oils are not replaced, then boots will be more likely to show signs of flex cracking earlier. Leder-Gris original is suitable for all types of footwear used in average UK conditions and will not significantly soften leather. Please note, this wax is supplied to us in either brown or clear dependent on Altberg's stock. However, both products are identical in every other way and perform the same. 'In the early nineties I started to become unhappy with the water absorbency of the leather we were using on our gamekeeper boots - we were using a WR100 leather. We had noted that after 6 months the leather we were using in our gamekeeper boots was absorbing...over twice as much (as it ought to have). I took the leather and boots to the Pittards Tannery laboratory in Leeds and they quickly identified the problem - it was not the leather - but the leather treatment! The gamekeepers had been using a bootcare product which contained a high amount of hydro carbon based solvents (coal/oil based waxes with paraffin, white spirits etc). These bootcare products had been developed many years previously for leathers tanned in the old way, however, the new water repellent boot leathers were different - and although these bootcare products were acceptable on some leathers - they had a tendency to neutralise the water repellent components tanned into the more modern WR100/Anfibio/Hydro type leathers.